Mountain – or “alpine” – glaciers are small ice bodies (from 1 to 10 000 km2). Although they represent only 0.3% of the total volume of the present-day cryosphere, they contain a large amount of useful information on the past climatic conditions on the continents. The position of the glacier margins, and its volume, is defined by its mass balance (the balance between ice accumulation and ice melt), that is mainly controlled by two important climate variables: air temperature and snow precipitation. Their internal behaviour is very sensitive to climate change, and they respond rapidly (<50 years) to climatic fluctuations. This gives alpine glaciers the ability to record climate change with a high temporal resolution. (iii) Perform computer-based numerical model simulations to infer the main climatic parameters (temperatures and precipitation) from the variations of glacial volumes (Fig. 1c). Note that the position of a glacier may be considered as a “2 unknowns – 1 equation” problem, making useful any independent inputs from other continental paleoclimatic proxies, when available. These could for example be pollen-based reconstructions, lake level fluctuations or isotopic tools (measured in speleothems, lacustrine inorganic deposits or biogenic carbonates) that can bring quantitative constraints on temperature, precipitation or both (see previous posts for more information). If such complementary proxies are not available in the studied areas, it is necessary to remain cautious and propose a range of possible paleotemperature and paleoprecipitation reconstructions (Fig. 1c). (iv) Because glaciers respond to both temperatures and precipitation amount, glacier fluctuations have also been used to reconstruct the changes in past precipitation or ‘paleoprecipitation’ at a high spatial resolution. The typical size of glacier watersheds is few hundreds to thousands square kilometers, which make them ideal paleorainfall gauges. This allows us to determine the paleoprecipitation variability at the regional scale (e.g. 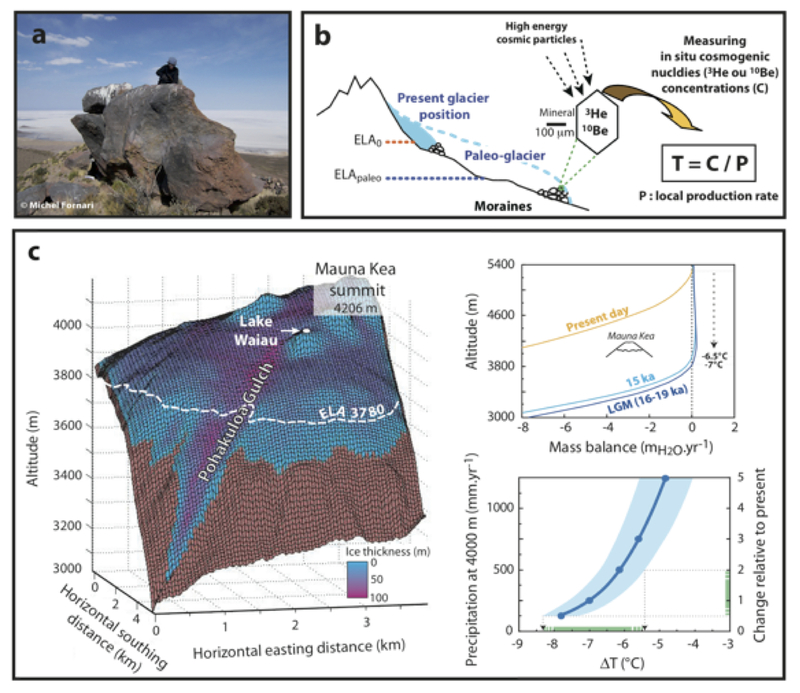 Martin, 2016 used paleoglaciers to establish the spatial pattern of rainfall in the Tropical Andes during the Heinrich 1 event, 16,000 years ago). Blard et al. (2007) - Persistence of full glacial conditions in the central Pacific until 15,000 years ago, Nature 449 (7162), 591. Clark et al. (2009) - The last glacial maximum, Science 325 (5941), 710-714. Rabatel et al. 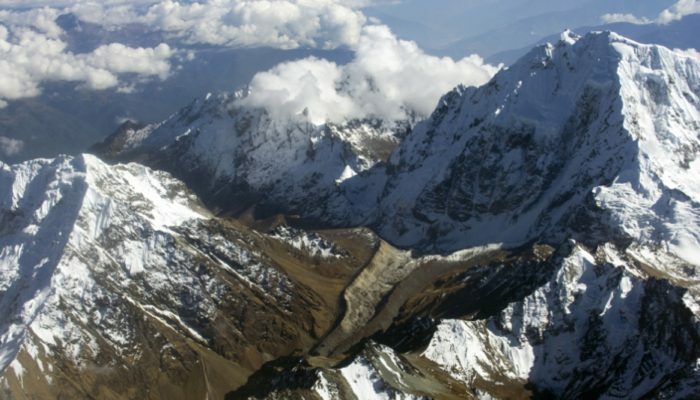 (2006) - Glacier recession on Cerro Charquini (16 S), Bolivia, since the maximum of the Little Ice Age (17th century), Journal of Glaciology 52 (176), 110-118. Schaefer et al. (2006) - Near-synchronous interhemispheric termination of the last glacial maximum in mid-latitudes, Science 312 (5779), 1510-1513. Tripati et al. (2014) - Modern and glacial tropical snowlines controlled by sea surface temperature and atmospheric mixing, Nature Geoscience 7 (3), 205-209. Figure 1. 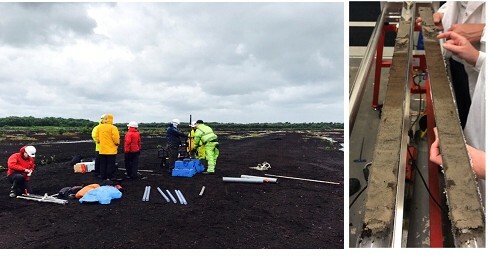 Extraction and splitting of glacial lake cores from Chat Moss, Lancashire, U.K.
Proglacial lakes form in front of glaciers and act as sinks for water and sediment flowing from melting ice. Analyses of proglacial lake sediments enable continuous reconstructions of glacial and foreland environmental change, including annually resolved (varved) records. Varves typically consist of two layers, a coarse sand or silt layer capped with a fine grained clay layer separated by a sharp contact (fig. 2). Varves form due to seasonal fluctuations in glacial environments. These include processes like meltwater and sediment input, lake ice cover, wind shear and precipitation. The relative age of a varved sequence can then be counted as this repeating cycle means each pair of layers represents a single years’ worth of deposition (Ashley, 1995). The ability to count a single year from thousands of years ago far exceeds the resolution achievable from other dating techniques, which may have error bars of hundreds to thousands of years. Another advantage of using varves is that they form in glacial lakes with very little biological activity. Many other proxies and dating techniques rely on biologically produced matter and cannot be used to study environments very close to glaciers. These areas are often key in understanding ice-sheet behaviour and is another reason varves are an important tool in environmental reconstructions. Many glacial lakes formed during the Last Glacial Termination (LGT, c.21-14 ka) as large terrestrial ice-sheets retreated or melted entirely. In areas such as the British Isles there is no remnant of ice; however many sites of paleo-lake sediments are preserved. Analyses of these sediments allow the environmental impact and rate of ice retreat to be modelled. This can be used to constrain timing of periods of ice growth and decay or can be correlated with paleo-temperature records from ice cores to model ice-sheet response to temperature change. Varves allow for a continuous record of environmental change to be constructed and provide a method of calculating the rate of these changes. Due to this, they are an ideal proxy for reconstructing paleo-ice environments from the LGT and subsequent glacial re-advances at sites that no longer support ice-sheets. Varved sediment sequences in the British Isles have been used to constrain dating of ice advances and retreat. During a period of glaciation biological activity shuts down and environmental indicators such as pollen or insect remains cannot be used. Varves are then used to bridge these gaps and provide a method of calculating how long glacial periods lasted. An example of this is the precise dating of the onset and duration of ice advance during the Younger Dryas cold period in Scotland (12.6-11.5 ka) using varved sequences (MacLeod et al., 2011). As well as paleo-records, modern glacial lakes may also contain varved sediments. These records can provide insights into anthropogenic impacts on glaciers and glaciated environments. Modern varve records can also be correlated with meteorological records and lake monitoring to refine the model of varve formation and controls on glacial lake sedimentology. Correlating meteorological conditions with varve characteristics has shown that local climate processes, such as precipitation (Cockburn and Lamoureux, 2007) and snow melt (Leemann and Niessen, 1994), can be recorded and reconstructed from varves. This means that records of climate covering the last hundreds or thousands of years can be extracted from lakes and used to determine how they have changed with increasing human impacts on the Earth’s climate. Through the use of models of paleo-environmental change and more recent records of lake dynamics, varves provide a method of prediciting the future behaviour of ice sheet response to climate warming. 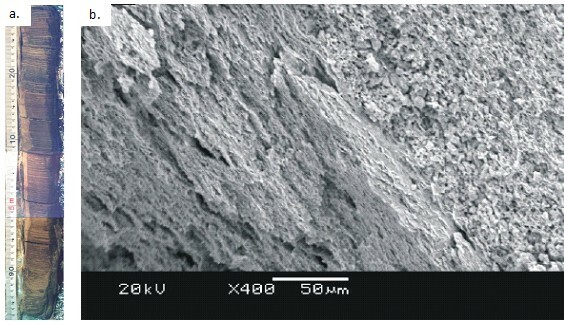 Ashley, G. M. (1995) ‘Glaciolacustrine Environments.’ In Menzies, J. (ed.) Glacial Environments, vol. 1: Modern Glacial Environments. Processes Dynamics and Sediments,. Oxford: Butterworth Heinemann, pp. 417–444. Cockburn, J. M. H. and Lamoureux, S. (2007) ‘Century-scale variability in late-summer rainfall events recorded over seven centuries in subannually laminated lacustrine sediments, White Pass, British Columbia.’ Quaternary Research, 67(2) pp. 193–203. Delaney, C., Hambrey, M., Christoffersen, P., Glasser, N. and Hubbard, B. (2009) ‘Seasonal controls on deposition of Late Devensian glaciolacustrine sediments , Central ireland : Implications for the construction of a varve chronology for the British-Irish ice-sheet Seasonal Controls on Deposition of Late Devensian.’ In Glacial sedimentary processes and products. Oxford: Wiley-Blackwell, pp. 149–163. Leemann, a. and Niessen, F. (1994) ‘Varve formation and the climatic record in an Alpine proglacial lake: calibrating annually- laminated sediments against hydrological and meteorological data.’ The Holocene, 4(1) pp. 1–8. MacLeod, A., Palmer, A., Lowe, J., Rose, J., Bryant, C. and Merritt, J. (2011) ‘Timing of glacier response to Younger Dryas climatic cooling in Scotland.’ Global and Planetary Change. Elsevier B.V., 79(3–4) pp. 264–274. What is in the (European) air? You thought that Mauna Loa was the only observatory to provide continuous measurements of atmospheric carbon dioxide concentration and were disappointed because Hawaii is way too far from your study area or because you wanted to know how bad the air is in your hometown? The US have been monitoring the composition of the atmosphere since 1972, but what about Europe? 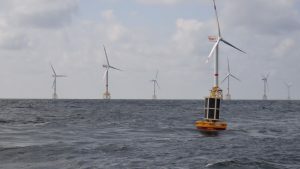 Since 2008, Europe has its own measurement network that is managed by a research infrastructure called ICOS (Integrated Carbon Observation System). Since the beginning of the industrial era (around 1750), atmospheric concentrations of greenhouse gases such as carbon dioxide (CO2), methane (CH4) and nitrous oxide (N2O) have increased, mostly because of human activities. As a consequence, the climate is getting warmer, which could have dramatic impacts on our daily life. The evolution of the atmospheric composition should therefore be closely monitored. To improve our understanding of the climate system and achieve good climate predictions, high-precision measurements of greenhouse gas sources and sinks are needed. A large amount of datasets already exists, but the problem is that these data are often too difficult to access, too scattered, not consistent or not reliable. ICOS also encompasses an educational dimension by training young scientists through summer schools, workshops and conferences and by spreading knowledge about the carbon cycle to the general public. ICOS is subdivided in national networks managed by research institutes. Twelve countries are currently members of ICOS: Belgium, Czech Republic, Denmark, Finland, France, Germany, Italy, Netherlands, Norway, Sweden, United Kingdom and Switzerland. The regional dynamics of greenhouse gases is monitored thanks to a network of 126 measurement stations implemented across these countries. 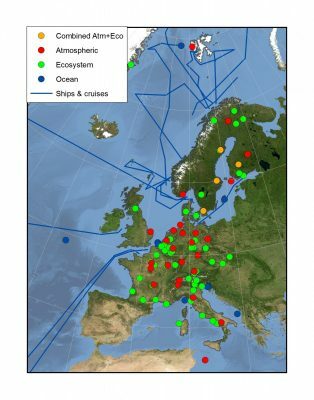 Among these stations, 71 are ecosystem stations, 34 are atmospheric stations and 21 are ocean stations (Figure 1). ICOS grows rapidly and 8 other countries are expected to become members soon: Poland, Ireland, Estonia, Portugal, Spain, Hungary, Greece and South Africa. To be part of the ICOS standardized network, candidate sites have to follow strict specifications regarding equipment, measurement protocols and data processing in order to ensure a homogeneous dataset. 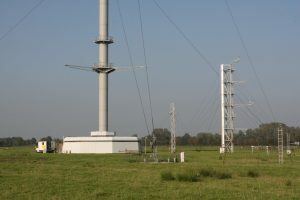 Periodic measurements are also carried out across the network with independent instruments to limit systematic errors. Moreover, ICOS is planning to render its data products compatible with outputs from other international measurement networks by taking part in an intercomparison program. 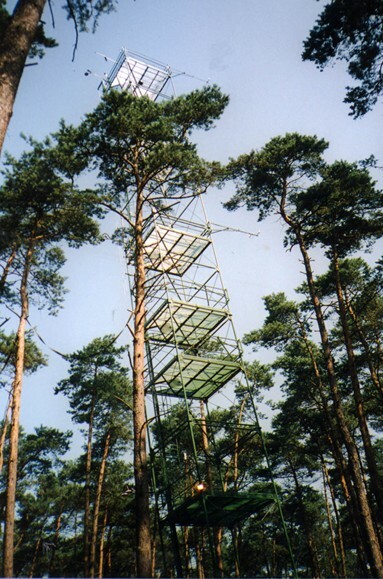 Atmospheric CO2, CO and CH4 concentrations are continuously measured in atmosphere stations, together with a range of usual meteorological variables such as air temperature, atmospheric pressure, relative humidity, wind direction and speed. 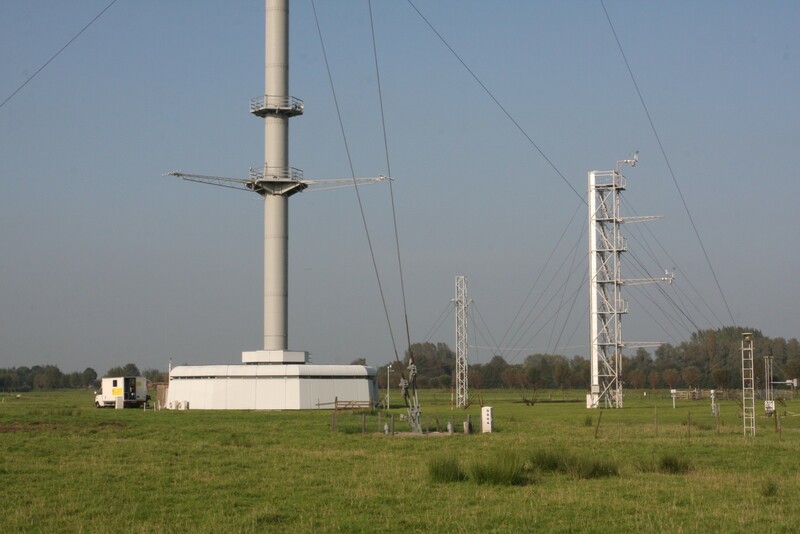 Flux towers measure the exchange of water vapour, greenhouse gases and energy between the different types of ecosystems and the atmosphere. The list of variables collected at ecosystem stations is available here. 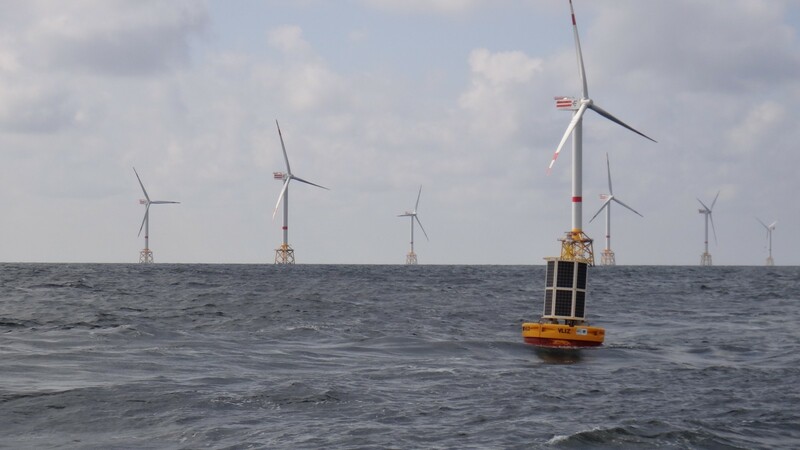 Ocean stations include ships, fixed buoys and flux towers. Carbon fluxes are measured at the ocean-atmosphere interface together with other marine variables such as pH, temperature, or salinity. You can have a look at the exhaustive list of measurements here. Data collected by national network stations are gathered, processed and stored by central facilities called Thematic Centers (TC): the Atmosphere Thematic Center (ATC), the Ocean Thematic Center (OTC) and the Ecosystem Thematic Center (ETC). You can access all these precious data for free here on the carbon portal. Among many examples, you can find ecosystem fluxes time series, atmospheric methane observations or global carbon budget. It is easy to handle as you can apply filters to refine your search, click on the “eye” icon to preview the data, or just select the dataset to obtain its description. These data are protected by a Creative Commons Attribution 4.0 international licence, which means you can share and even modify them provided that you document any change, mention the original data source and give a link to the licence text (https://data.icos-cp.eu/licence). It is of course necessary to cite ICOS when you use the data. To make this as easy as possible, the citation is provided when you download the data set. On the website of the Atmosphere Thematic Center, you can also find near real time data that are computed from all ICOS atmospheric stations every day in the morning. For example, Figures 5 and 6 show time series of the fraction of CO2 (top plot) and CH4 (bottom plot) in the air mass coming from the European continent measured at Mace Head station (MHD). Depending on the wind direction, this atmospheric station, located on the west coast of Ireland, is exposed to either the North Atlantic Ocean air mass and or the European continental air mass, offering a unique way to study these very different air masses. Time series for the period 2011-2017 show a clear upward trend for both greenhouse gases in the continental air mass. These increases are mainly caused by growing emissions associated to human activities. Hopefully, this post helped you to get to know ICOS better. Do not hesitate to use this great tool in the future! For those interested, the 3rd ICOS Science Conference will take place between the 11th and the 13th of September 2018 in Prague, Czech Republic. Figure 1: Planktonic foraminifera Globigerina bulloides specimen (scanning electron microscope picture of Isabel Cacho). Foraminifera (or Forams) are single-celled organisms varying from less than 1 mm to several cm in size. They are very abundant in the ocean floor (benthic species) or floating amongst the marine plankton (planktonic species) where they produce their shells mostly using calcite (CaCO3). The oldest fossils of benthic foraminifera date back to the Cambrian period (older than 485 million year ago (Ma)) (Armstrong and Brasier, 2005). Planktonic species are younger than the benthic group. For instance, the species Globigerina bulloides (Figure 1) range from Middle Jurassic (180 Ma) to recent times (Sen Gupta, 1999). A large spectrum of information can be provided by the analysis of foraminifera shells, based on the chemical composition and morphology of their shells as well as the species abundance patterns. One type of proxy is the ratio between the abundance of magnesium (Mg) and calcium (Ca) (Mg/Ca ratio) present in the calcite shell. During the formation of the shell, Mg is incorporated and may weaken the shells. In some cases, it seems that foraminifera expend energy to control the incorporation of Mg (Toler et al., 2001). The substitution of Mg into calcite depends on the temperature of the seawater, so that the amount of Mg in the shell exponentially increases from cold to warm water (Lea, 1999). This means that the Mg/Ca ratio of the shells is expected to rise with increasing temperature (Rosenthal, 2007). Measuring the Mg/Ca ratio of foraminifera shells therefore allows reconstructing the sea surface temperature (SST) of the past. What are the key findings that have been done using Mg/Ca-SST? Past SST determination is essential for understanding past changes in climate. An advantage of the Mg/Ca ratio measured on the shells of planktonic foraminifera is that the same sample can be used for different types of analyses in order to obtain a large set of information on the past sea conditions (Elderfield and Ganssen, 2000; Barker et al., 2005). Another advantage of this Mg/Ca proxy is the possibility to reconstruct changes of temperature within the water column using multiple species living at different depths and/or coming from different seasonal habitats (Barker et al., 2005). This can give us, for example, valuable information for describing seasons in the past. Planktonic foraminifera can survive in a wide range of environments, from polar to tropical areas, thus the analysis of their shells allows reconstructing the ocean conditions all around the world. Moreover, foraminifera are very sensitive to temperature and environmental changes therefore it is possible to reconstruct climate changes of various amplitudes and timescales, e.g. the Paleocene-Eocene Thermal Maximum (55 Ma) or the more recent climate oscillations (Zachos et al., 2003; Cisneros et al., 2016). For instance, Figure 2 shows that Mg/Ca ratio allows reconstructing the ~2ºC warming observed from the Roman Period onset to higher frequency thermal variability like those observed in the Little Ice Age (LIA). Figure 2: Sea Surface Temperature (SST) record stack for the last 2700 years reconstructed by means of Mg/Ca analysed on the shell of the planktonic foraminifera Globigerina bulloides in the central-western Mediterranean Sea. The different historical/climate periods are indicated: TP=Talaiotic Period, RP=Roman Period, DMA=Dark Middle Ages, MCA=Medieval Climate Anomaly, LIA=Little Ice Age, IE=Industrial Era. Years are expressed as Before Common Era (BCE) and Common Era (CE). The grey shaded area integrates uncertainties of average values and represents 1 sigma of the absolute values. This uncertainty includes analytical precision and reproducibility and the uncertainties derived from the G. bulloides core-top calibration developed in the original reference. (Modified from Cisneros et al., 2016). Armstrong, H. and Brasier, M., Foraminifera. In: Microfossils, Blackwell Publishing, pp. 142-187. Lea, D.W., 1999. 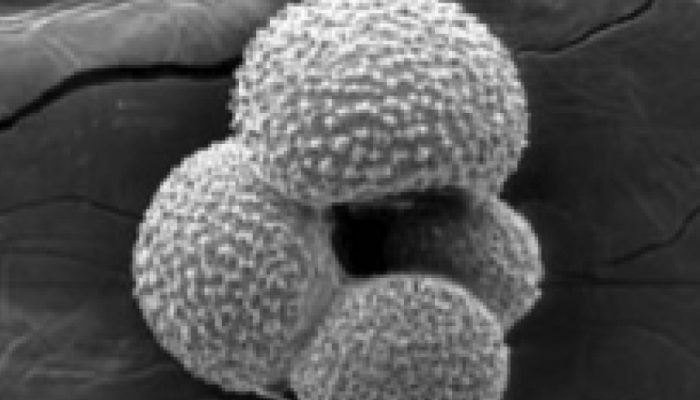 Trace elements in foraminiferal calcite. In: Sen Gupta, B.K., (), Modern Foraminifera, Great Britain, Kluwer Academic Publishers, pp. 259-277. Rosenthal, Y., 2007. Elemental proxies for reconstructing Cenozoic seawater paleotemperatures from calcareous fossils. In: Hillaire-Marcel, C. and de Vernal, A. (), Developments in Marine Gelology, Elsevier, pp. 765-797. Sen Gupta, B.K., 1999. Introduction to modern Foraminifera. In: Sen Gupta, B.K., (), Modern Foraminifera, Great Britain, Kluwer Academic Publishers, pp. 3-6. Toler, S.K., Hallock, P., and Schijf, J., 2001. Mg/Ca ratios in stressed foraminifera, Amphistergina gibbosa, from the Florida Keys, Marine Micropalentology, 43, 199-206. Zachos, J. C., Wara, M. W., Bohaty, S., Delaney, M. L., Petrizzo, M. R., Brill, A., Bralower, T. J., and Premoli-Silva, I., 2003. A transient rise in tropical sea surface temperature during the Paleocene–Eocene thermal maximum, Science, 302, 1551–1554.